Our neighborhood votes at Meadow Hall Elementary School, in Rockville. Normally you park in front of the building, walk in, and vote. Sometimes, since there's no school, I park in the principal's parking place, just because I can and because it's close to the door. The election judges are your neighbors, so you yack a little bit with them, you go to the machine, make your choices, and you're out of there. This morning there was no place to park, we literally parked in a no-parking spot on the street, hoping the cops would be cool and not give people tickets for voting. All through the neighborhood you saw streams of people walking toward the school, alone and in groups, deliberate and solemn. As we approached the building we could see there was a line, but it wasn't until you went inside that you saw the magnitude of this. The line snaked from the auditorium, where the voting machines are, down the hall past the front doors of the school, around the corner, around another corner, and back to the end of the building. Kids from the high school went up and down the line offering to run for breakfast for you, to raise funds for this-and-that team or club. The chief election judge came down the line and said there were chairs for people if they were disabled or felt like they were going to faint. Christine Grewell emailed me a picture she took outside Woodlin Elementary School this morning. The line went down the block, past the playground and into the neighborhood. The whole country is doing this today. People talked quietly among themselves. We saw some neighbors we don't see very often, and caught up a little. I didn't hear anybody talking politics, nobody was saying who they planned to vote for. It doesn't matter now, everybody's mind is made up. We're a little bit up-county, I imagine we have some Republicans, compared to other parts of Montgomery County, or Maryland, for that matter. Whatever, they can vote for their guys, we'll vote for our guys, there's nothing to argue about at this point. Somebody's going to win, somebody will lose, there will likely be some grumbling. I hope there's no cheating, I hope this isn't one of those elections that gets settled by some judges, I hope the people select a leader with a clear majority and tomorrow we'll know who the winner is. Both parties are saying they can win. Yesterday, Obama spoke to a crowd estimated at 80,000 to 100,000 in Manassas, Virginia, while McCain addressed a crowd of 5,000 in Indianapolis. Both Indiana and Virginia are traditionally Republican states. I talked to one mom whose adult son is taking the Chinatown bus back from New York City to vote here, where he's registered. Another told me her daughter who works in Paris is flying back from France to cast her vote. Everybody wants to do their little part to get our country back on its feet. The ballot is short, it only took a few minutes to check the boxes and drop your card in the box, and so the line moved along at a pretty good pace. We got there at 7:10 and left at 8:20, so a little more than an hour in the line. I heard nobody complaining, did see one guy say he's going to come back later -- but he's somebody I know, and I know he will come back. I know that there are other neighborhoods in our town and county with more or fewer voting machines, and I have the feeling that the neighborhoods with fewer machines will have very high voter turnout today, so they will have some real lines in those places. You just hope nobody gives up and leaves because there's a couple-hour wait. It's like this everywhere. Today America will select a new President, it's our opportunity to pull out of the eight-year nightmare that has divided us against each other and alienated us from the rest of the world. Personally I favor a cleaner break with the past, but you'll decide according to your beliefs and your conscience, I'm not going to try to talk you into anything. I imagine this will be the last "political talk" post, well, maybe we'll want to re-hash it for a couple of days afterwards. Let's hear what you saw at your polling place, what you're hearing on the news, in the office, in the neighborhood. Tell us why you think your candidate is going to win. (CNN) – John McCain and his aides are still banking on a come-from-behind victory Tuesday, but the GOP's most famous political strategist has already called the race for Barack Obama. In an Electoral Map posted on Rove's Web site, the Republican mastermind predicts Obama victories in several key battlegrounds, including virtually all of the states where polls suggest he currently enjoys a slim advantage. In fact, Rove believes Missouri is the only crucial battleground state McCain will carry, while Obama scores victories in Florida, Ohio, Pennsylvania, Colorado, New Mexico, Minnesota, and Iowa. Rove also thinks Obama will win traditionally-Republican Virginia. The lines were long in Kensington. About 50 minutes at 7:15, although when I left they were about 2/3 shorter. The youth vote did indeed seem to be present. The phenonmenom of people walking rather than driving was noticeable although I didn't notice anybody I'd characterize as "deliberate and solemn". Maybe people in your neighborhood didn't get enough sleep. Everyone in line was greeting one another and chatting. Conversations were normal not "talking quietly among themsleves". There "likely" will be no "grumbling" unless McCain pulls off an upset, in which case we'll get an extension of the grumblefest of the last eight years among liberals. Obama is not the best candidate but we'll survive and, if nothing else, having an African American president will be an encouragement for minority kids all over American that their possibilities are not limited. 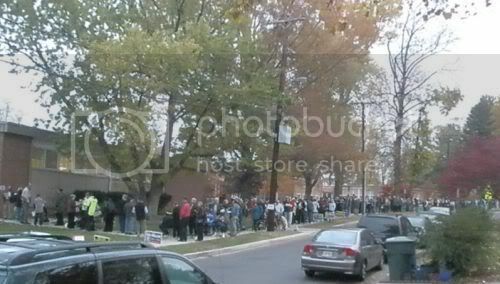 Channel 7 noon news reports massive turnout in Virginia and Maryland. What an exciting day for our country. At the Olney Swim Center there was a huge line outside prior to the opening of the polls. The line got longer as the voting began. The voting went smoothly, with no problems, so the line moved along. Based on my past experience (I have been working at this, my home precinct, for Board of Education candidates for more than 20 years) I assumed that the line would ease up by 8:30. But there was no easing up. Indeed, by 11:00 AM, the line was even longer than it was at 8:00 AM. While in past years, there was always a Republican Table and a Democratic Table, this year only the Democrats showed up. My wife came by around 11, and we got in line to vote. It took us nearly an hour to get into the voting area -- and then only five minutes to actually cast our ballots. I paused for a moment to savor my vote for Senator Obama. As we left the building, the sun popped out for a few minutes. Then we went downcounty to take my mother to her polling place in Silver Spring. Chris Grewell was there and she reported that the lines were very long earlier, but by the time we arrived, my mom was able to go right in and vote. I then went back to Olney and worked a few more hours. The rain got heavy as it got darker late afternoon. Since no one was likely to stop and chat about candidates in that weather, all of us who were there to support candidates wrapped it up for the day. The turnout numbers appear to be very high in Olney. I would not be surprised if this is the highest turnout our precinct has ever had. If this is the pattern across the country, we may be having, to paraphrase Lincoln, a new birth of democracy. "I paused for a moment to savor my vote for Senator Obama." Perhaps you should set up an area in your home with a gilded picture above a table with some votive candles. You could savor your adoration daily. Idol worship has a long history. 2 hours to vote early in the morning at St. Luke's at Colesville and Dale but the lines got shorter- it took my husband and son about 45 minutes at 10 Am. In Sterling,VA, we had no significant lines from 11:30 on- but early voting may have accounted for some of that. We also had no Republican table at our precinct- we rarely do- Sterling,Va is a different story. They have a table and actual Republicans voting there. I saw more McCain- Palin signs at the precinct I worked at than all of Silver Spring. Obama is the best candidate and he will be a good president. And thank goodness, Sarah Palin will never get closer to the White House than the upgraded tour. "And thank goodness, Sarah Palin will never get closer to the White House than the upgraded tour." She's young and she's smart. Polls say only 22% of Americans call themselves liberal. After four years of unrestrained Nancy Pelosi, America will be ready for a change. No more excuses for Democrats! I don´t count my chickens unless I am 100% SURE!! FINALLY!!! American will get back its dignity and truth! Odd you would say that, Drick. Our president-elect is a pragmatist who opposes gay marriage. You usually say people who hold that position are hateful bigots. You might be confused about what a true uniter is given Bush's attempts at it, but the nation heard Obama reach out to all Americans last night, he speciifcally included "gay or straight Americans." I heard the "gay and straight together" remark. That doesn't translate into redefining marriage. I'm assuming our new President will keep his word. Obama has a stake in moderation. Pelosi can be a lunatic and still get re-elected in 'Cisco. Obama has to be re-elected nationally in four years. The anonymino seems to think gay marriage is the only or defining concern of lgbt people. To me, it's not nearly the most important. Other things, such as governmental discrimination, employment an services discrimination, safe schools, safety on the streets, etc., are crucial. Marriage is important, but it's not the only issue. Obama is an ally. The GOP was not so much. If you truly support the welfare of kids, drop out of the teacher union and support school choice so low income parents will have an alternative when their local public school becomes, or continues to be, dangerous. Mayor Fenty in DC supports this. So does the Washington Post. What about you? OMG, Anonymous...you just don't get it, do you? Over 60% of the American people think that Ms. Palin is NOT qualified to serve either as President or Vice President! (Fortunately, the results of the election put that lunatic fantasy to rest.) A Governor of a State who doesn't even know that Africa is a continent or what the countries are that comprise North America is hardly qualified to hold any position above that of Mayor of Wasila, Alaska. Almost laughable if it weren't so tragic. Did you realize that the population of Montgomery County, Maryland, is much greater than the population of the whole state of Alaska? Ike Leggett has more constituents than Sarah Palin. "Over 60% of the American people think that Ms. Palin is NOT qualified to serve either as President or Vice President! (Fortunately, the results of the election put that lunatic fantasy to rest.)" Sorry to disillusion you, but they're wrong. She was every bit as qualified as our new President-elect. She'll run in 2012 and likely get the nomination. You just don't get it. America is a center-right nation that just held a protest vote against an incompetent administration. McCain's only leads in the race are when it was revealed that Obama was closely associated with a radical liberal preacher and when he choose a pro-family advocate for VP. America didn't suddenly get liberal. It threw the bums out. The future Republican leadership will come from outside Washington. And next time, Dems will have a record to run on, with no excuses. "A Governor of a State who doesn't even know that Africa is a continent or what the countries are that comprise North America is hardly qualified to hold any position above that of Mayor of Wasila, Alaska. Almost laughable if it weren't so tragic." Kind of like when she supposedly didn't know what the "Bush Doctrine" was and, then, it turned out Charles Gibson, her interviewer didn't either because there was no generally accepted definition of the term. Who knows what the incident these anonymous staffers refer to was really like but it is certain they'd like to divert attention from one of the most poorly run campaigns the country has ever seen. What school gave these imbeciles a degree in political science? What future campaign would hire these "pros"? "Did you realize that the population of Montgomery County, Maryland, is much greater than the population of the whole state of Alaska? Ike Leggett has more constituents than Sarah Palin." Do you honestly believe that people who are governors of small states are disqualified from the Vice Presidency? Fun fact: Delaware has the same number of electoral votes as Alaska. Call up Barack. Turns out Ike Leggett is more qualified to be VP than Joe Biden. Beside the whole population thing, Leggett actually has executuve experience and, a plus: no one would have to start a "Hidin' Biden" type of operation to keep him from saing stupid things to reporters. We are TTF! We like Ike! Your attempts to turn fiction into fact is worthy of an addendum to "Alice in Wonderland"
Specious argument #1 - "Sorry to disillusion you, but they're wrong. She was every bit as qualified as our new President-elect." Ahem...Obama won, she and McCain LOST. Her "qualifications" contributed mightily to that defeat. ("About 60 percent of voters questioned by pollsters thought Palin was not qualified to be vice president" Washington Post, 11/05, pA27) Apparently Evengelical Republican voters adore her, though. But...Evangelical Voters did not win the election for McCain/Palin. Specious argument #2 - "McCain's only leads in the race are when it was revealed that Obama was closely associated with a radical liberal preacher and when he choose a pro-family advocate for VP." Exit-polls and Post-Election polls show that these bogus issues did not influence the final vote. The state of the economy and eight years of mismanagement and influence-peddling by the Republicans, coupled with McCain's self-admitted ignorance about economic matters did that. I do agree with your assessment of the McCain/Palin campaign, though: "What school gave these imbeciles a degree in political science? What future campaign would hire these "pros"?" Add to that: what kind of campaign would offer a completely clueless and incompetent candidate like Ms. Palin for voters to pass judgement on? And if you felt so strongly about Mr. Leggett's qualifications for Vice President (far, far exceeding those of Ms. Palin) you should have spoken up earlier... although your statement about Sen. Biden's (now Vice-President Elect) qualifications qualify you for nomination to the Nitwit Hall of Fame.